A great way to see a new city is to schedule a stop-over on the way to your main destination. When I travel I prefer to spend more time one day a city. I'd prefer at least a week to really get the feel for it. However, if an airline offers a full day layover at no extra cost, I'm not going to turn that opportunity down. I've seen Istanbul and Copenhagen this way, and recently on a trip back home to Texas I was able to spend one day in Mexico City on a 12-hour layover. What to see in Mexico City? I chose to focus on the historic center. I marked a few Mexico City attractions I really wanted to see beforehand, but I'm lucky to have a good friend who lives there. He picked me up from the airport and spend the day as my Mexico City guide. He gave me such a great tour! Below is our one day in Mexico City itinerary: what we saw in the order that we saw it. 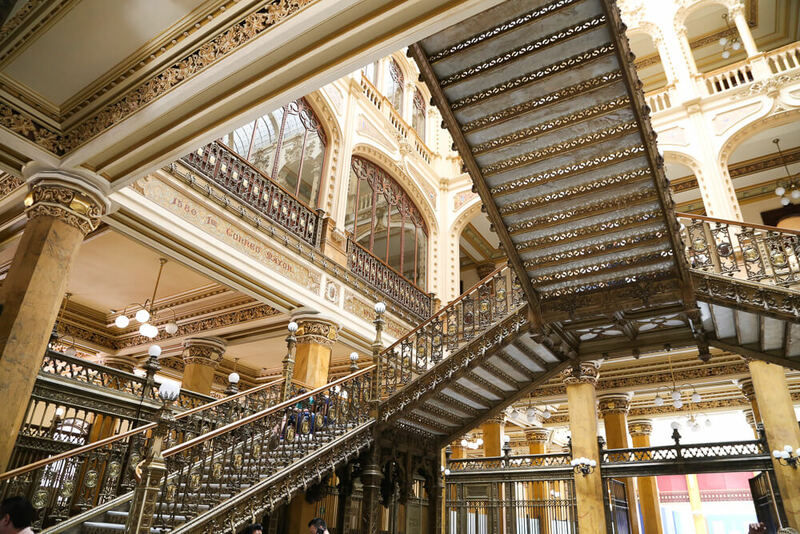 Everything is close together within the centro historico and can be mixed and matched according to your schedule. At the bottom of the post, I've included a Google Map with pins marking all the top places to visit in Mexico City. Is Mexico City safe? I felt very safe all day, at least as safe as I feel in most major cities worldwide. Here's a personal account of why you should visit Mexico City. I'd just come from an overnight flight and needed a good meal and to get my bearings; so we started with a relaxing breakfast at Azul Histórico. We ordered chilaquiles and huevos rancheros to share since I couldn't choose one or the other. Both were TOO good; this breakfast was incredible, the food and the service both. We also had a pastry (a chocolate concha) and a juice and spent under 20 dollars including tip. Refreshed from breakfast we headed a couple of blocks over to the Zocalo, stopping first to see the impressive lobby of the Gran Hotel. It feels like you've stepped out of Mexico and into Paris. The ceiling is a glass canopy crafted by Tiffany at the beginning of the 20th century. Next, we headed to the Palacio Nacional so we took the long way across the main square, the Zócalo, by walking around the perimeter enjoying the view. The Zócalo is at the top of any Mexico City sightseeing list, and it's easy to see why! What I was most excited to see (besides tacos) were the murals by Diego Rivera. I remember seeing the stairwell mural that's in the National Palace in my high school Spanish textbooks and it was something I was not going to miss. We made a point to go early to avoid crowds. Entry was free and they ask you to check any large bags like backpacks or totes (also free of charge). The mural depicts the history of Mexico. In the center, you can see the coat of arms, an eagle with a serpent in its mouth. There are depictions of the Spanish conquest of the Aztec people, both military and religious. He's painted Frida on the left-hand side of the staircase mural. The murals continue along the corridor and depict pre-colonial life in Mexico. They were intended to completely wrap the corridor but were never completed. The building itself is also a work of art and very well maintained. It looks as if it's been lifted right out of Spain; so I appreciate the representation of pre-Spanish life being immortalized in such a Spanish building. After the National Palace, we turned back to the Zocalo to go inside the Cathedral. Go on inside and get blinded by the gold. 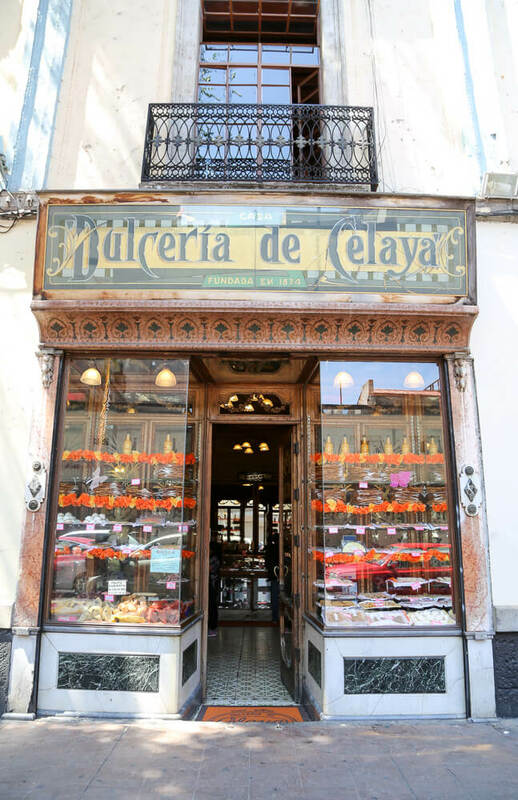 I was dead set on going to this candy shop just a couple blocks from the Zocalo on Avenida 5 de Mayo. I bought a lime filled with coconut that just called to me from the display case and stocked up on candies and sweets to bring back as gifts. It's a bit pricey compared to prices you'd spend in one of the markets but I think it was worth it. A post office you actually want to go to. This post office was built in the early 1900's and is still functioning today, just in case you want to send some tequila home. I don't think I'd mind the endless waits (stamps.com anyone?) if this was my post office. Next up was a stroll through the Alameda park to get to the Diego Rivera Museum. The park was impeccable. The plaza was originally an Aztec marketplace but has been a park since the early 16th Century. It's been renewed in recent years and is so clean and well maintained. The museum cost 30 pesos to enter, and an extra 5 pesos to be allowed to take photos. You're given a sticker to wear to show you've paid for photo rights, so don't get cheeky and try to sneak a picture without paying. It's only 5 pesos, you can handle it. The mural here is stunning. My friend studied art and film and thanks to him I was able to notice things I wouldn't have on my own. Diego Rivera painted himself into this painting, as a child with a toad in his pocket (a nod to people comparing him to a toad), right in front of Frida in the center of the painting. It's a small museum with just this one mural and a small exhibit space, but it's worth the entry all the same. Souvenir heaven! The Ciudadela Market was full of colorful temptations, but I was on a mission and that mission was huaraches. Mission accomplished. You can and should also buy beautiful blown glassware, embroidered blouses, and dresses, woven tapestries, and on it goes. I bought quite a bit but held myself back due purely to empty space limits in my carry-on. Of all the things to do in Mexico City, this was my absolute favorite. There are two San Juan Markets in the center. 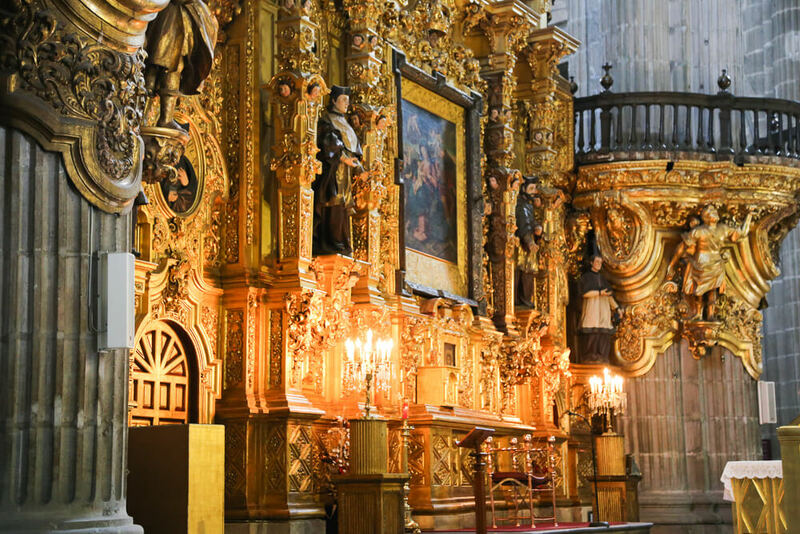 The one I was most excited to see was on the corner of Arcos de Belen and Lazaro Cardenas. It seemed more of an everyday market, a good spot for a quick, affordable meal and to do some shopping. I picked up some chile powder to take home: chile de arbol. This is the San Juan Market that will show up in your Google results, the gourmet market. 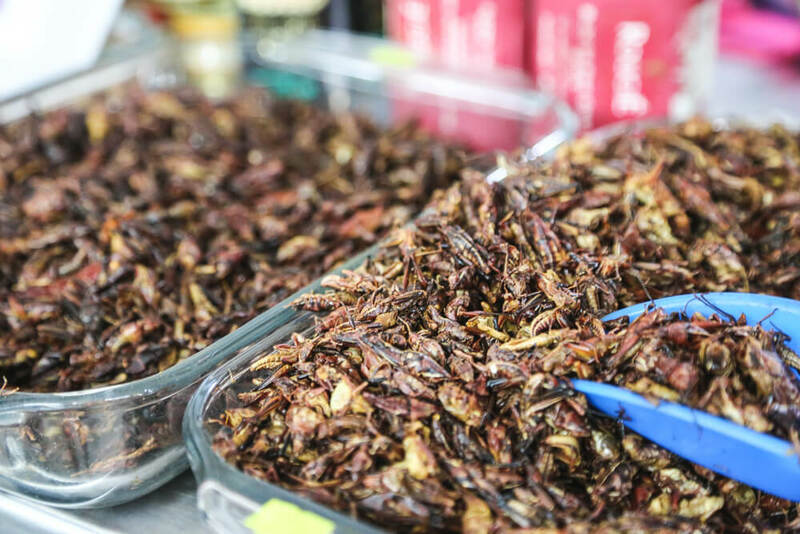 You can try some exotic things in this market from kangaroo or lion meat to insects. We tried the latter, buying a 50-gram bag of crickets. My friend was more daring and ate a scorpion bathed in mezcal. This is where I made my gravest mistake of the day. I was already pretty full and I wasted what little stomach real estate I had left on sweets. Don't get me wrong, they were delicious, you should go and try them. But my time was running out and after these churros, I was too full to eat more tacos. Champagne problems. If I could go back would I instead choose tacos al pastor? Obviously. 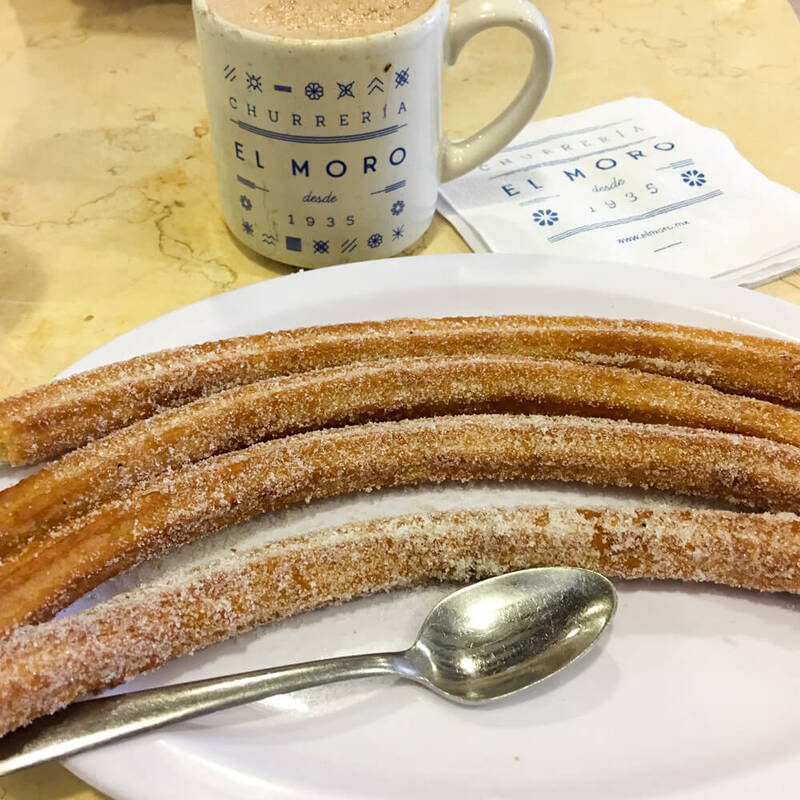 But did I also really enjoy these churros and hot chocolate? Also obviously. We ended the day with a drink together in La Opera, a cantina that's been around since the 1870's. 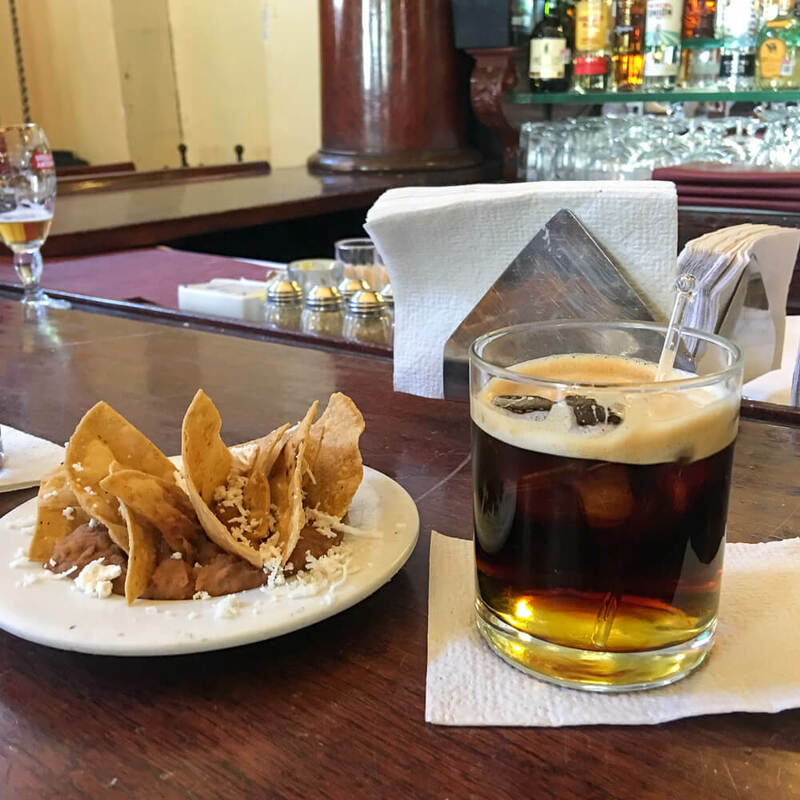 We ordered carajillos, liquor 43 with coffee, and were given topopos with beans and cheese along with it. The bar itself is stunning so it's worth going in for a drink at the very least to be able to see inside, but you could also have a lunch or dinner. Look for the bullet hole in the ceiling reportedly put there by Pancho Villa. House of Tiles, it's hard to miss, located just across the street from Bellas Artes. This palatial home was built in the 18th century and decorated with the traditional painted blue and white tiles from Puebla. There's a restaurant in the interior patio today so it's another good option to rest your feet. My friend needed to leave for work and left me to spend my last hour at Bellas Artes. Entry was 60 pesos, with an additional 30 pesos to be able to take photos. There's also a free bag check for anything larger than a small purse, but after a day of lugging a backpack around, I was more than happy to hand it over. 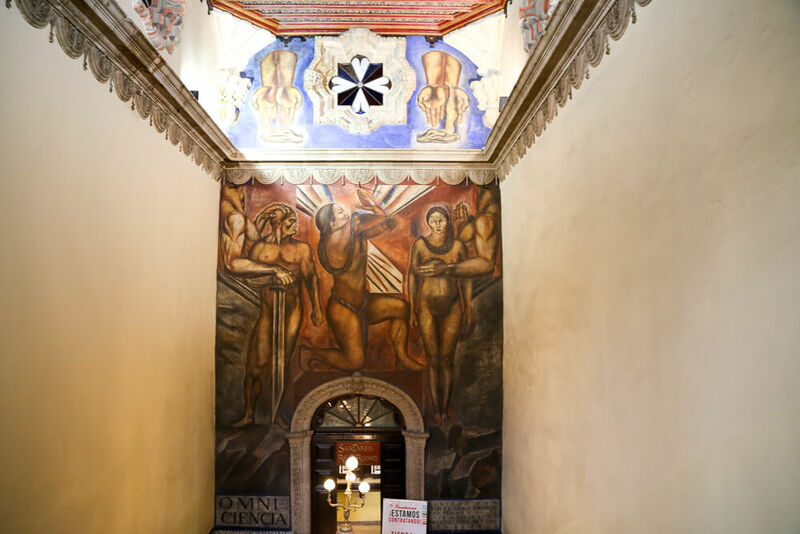 The upper floor is where the magic is, a veritable treasure of murals by the 3 best known Mexican Muralism artists. I spent about half an hour trying to take them all in. I wish I could have spent more time here but it was time to start making my way back to the airport. 12 hours will never be enough, I know that. But if you put your mind to it you can really cover a lot of Mexico City sights. There are so many places to visit and things to do here, that I'm very much looking forward to future trips to Mexico City to see more!